Nicole's Needlework: Stacy Nash Pinkeep Pillow Finished! I was determined to get it finished up last night so it wasn't hanging over my head. The holes on this linen were sooo tiny. I know it's got to be smaller than 40 ct. because I had a fairly big margin on the top and left side. Anyway, it's done! I want to go to a quilt shop and find some pretty backing material for it tomorrow. 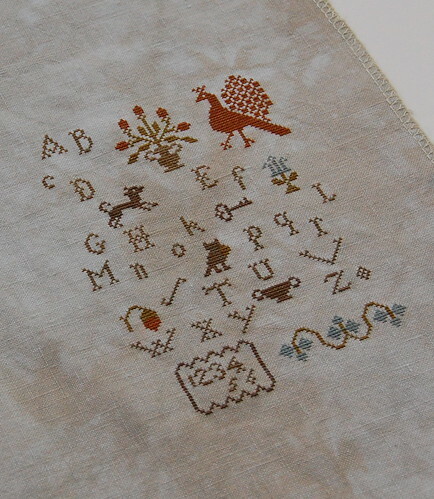 Stacy Nash "Early Style Alphabet Pinkeep Pillow"
I started Goode Huswife "With My Needle" today. I'm using DMC on the 40 ct. Light Examplar, which is still tiny, but not as tiny as the other! I don't have enough stitched to post a pic yet... maybe tomorrow? Write Later! Looks wonderful, love the colors. Congrats! What type of fabric were you thinking for the back? I really like Amy Bulter fabric. oooooh - lovely! Back in the stitching groove? gorgeous! can't wait to see it "finished". smaller than 40ct? yikes! Love the pinkeep! Glad you're back to stitching. And just a thought--have you had your vision checked lately? Certainly could be causing you to experience fatigue, etc, when working on the finer counts. I love, love, love it, Nicole!!! Primitive things really excite me. :) Can't wait to see what fabric you choose. BTW, where did you get your chart for 'With My Needle' from? Very cute Nicole...ya gotta love Stacy Nash patterns! I've stitched a couple myself! Congratulations on another Finish...I am so proud of you that you started and finish your project. It looks so beautiful. I can't wait til I see your WIP Progress.